A few months ago I had the wonderful opportunity of doing a commercial spot for Mazola, here it is….not sure what is going to become of it, but making the video was a GREAT experience! Thank you ACH! Preheat grill to medium heat, or between 400º to 450°F. Trim excess fat from chicken, rinse and pat dry using paper towels. If necessary, pound chicken to an even 1/2-inch thickness using a mallet, rolling pin or cast iron skillet (this will ensure the chicken cooks evenly). Place chicken into a 1-gallon size resealable plastic bag. Add seasoning, oil and lemon juice to the bag. Seal bag and turn to thoroughly coat chicken. Coat grill surface with grill spray to prevent sticking. Grill chicken over direct high heat for 4 to 6 minutes, rotate 90 degrees and continue cooking an additional 4 minutes (this process will give you beautiful grill marks on the chicken). Turn chicken and repeat as above until cooked through (internal temperature should be 160°). Transfer cooked chicken to a serving plate. 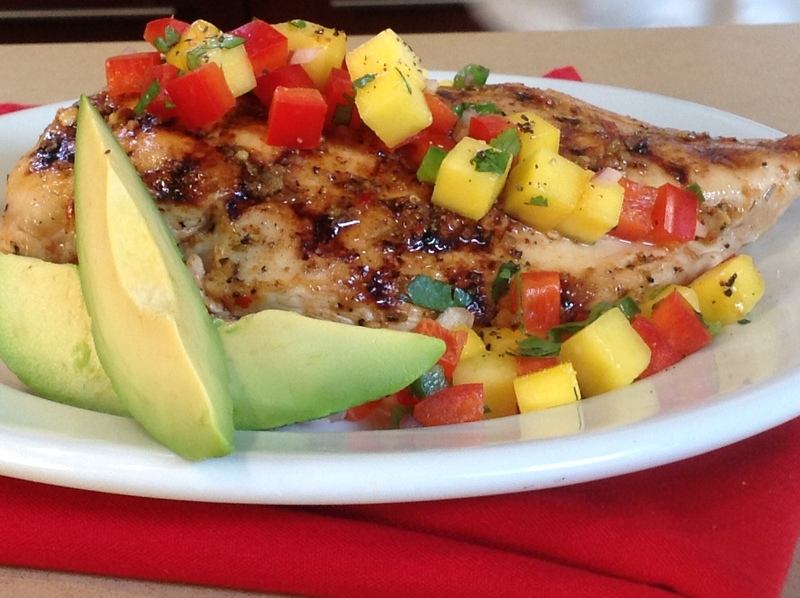 Recipe Tip: Try slicing the chicken onto warm, low-fat tortillas, top with mango salsa and crumbled queso fresco cheese for delicious spicy chicken wraps. I just LOVE Season’s 52 Restaurant…the food is aways fresh, healthy, and of course, seasonal. 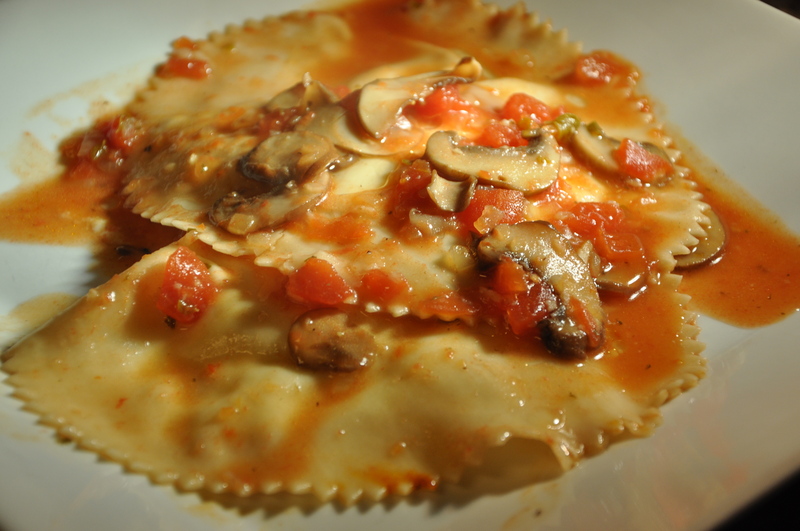 Last month Bob took me there for my birthday and I had this wonderful appetizer, goat cheese ravioli….YUM!!!! Last week I had a dinner party and thought that would be the perfect first course for my party. So I searched the internet and found a couple of copycat recipes…then the fun began…making it my own. I was very surprised that the ravioli is actually made with egg roll wrappers, thus making it very very easy for any home cook to prepare. First off, know that this probably isn’t something you would make during the week after working all day, but for a fun Saturday or Sunday cooking experience, it really is very easy, just a little time consuming. Preparing the filling is what you will do first. One thing I LOVE about this ravioli is you can make them up way in advance and they will be fine in the refrigerator until ready to use. You will need 1 11 or 12 ounce log of goat cheese, mozzarella, ricotta, parmesan, one egg, white pepper, fresh basil and whatever other shredded cheese you would like (I also used some shredded provolone. Place all of the ingredients in the bowl of a food processor and process until smooth and creamy. On a clean work surface, place 1 egg roll wrapper and brush with an egg wash (1 egg plus 1 teaspoon water). In center of wrapper, place one scoop of cheese mixture and lay another egg roll wrapper over cheese. Press and seal the edges, pushing out all the air pockets. 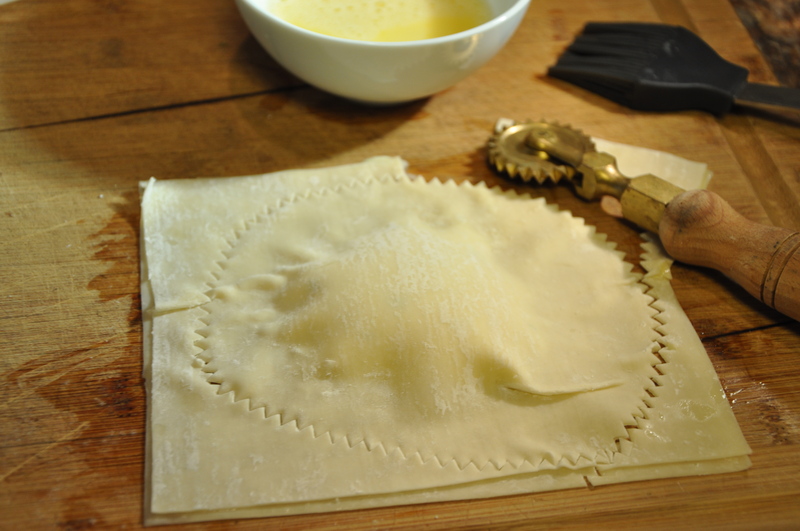 Using a knife or a ravioli cutter, trim ravioli. 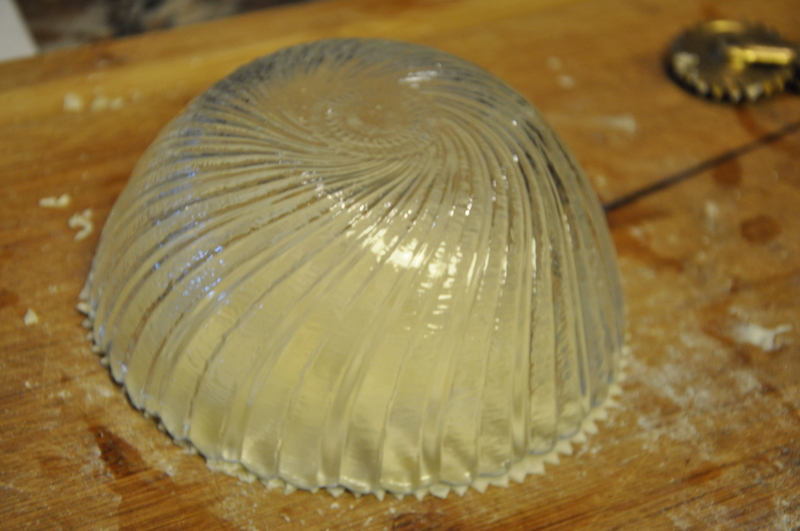 If desired, place a small bowl over ravioli and trace bowl for a perfect circle. Repeat until all wrappers are used or filling. My recipes makes 9 ravioli, or one full package of egg roll wrappers. 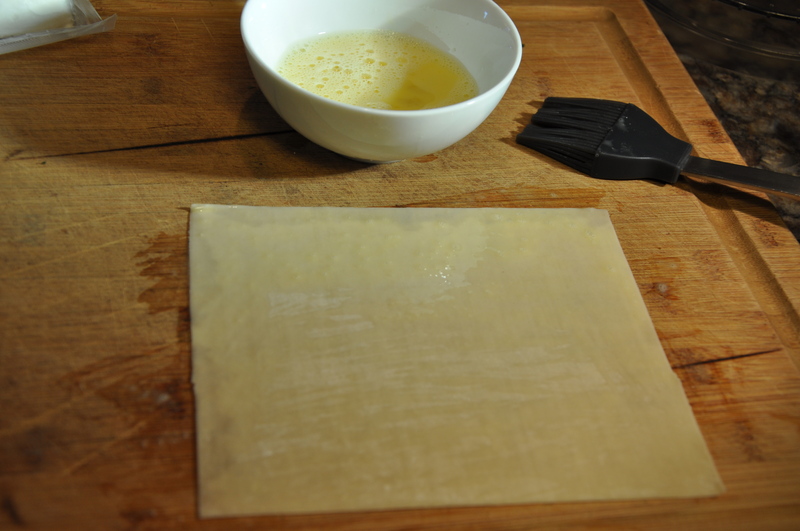 Place raviolis on a sheet pan, cover and refrigerate until ready to poach. To prepare the sauce, in a large sauté pan add 1 tablespoon extra virgin olive oil and 1 tablespoon butter, cook over medium heat until butter is melted. Add 1-2 small shallots or ½ onion, finely chopped, garlic and white pepper. (I had a package of baby portobello mushrooms in the frig, so I thinly sliced them and added them with the shallots and garlic). Cook until shallots are soft, about 3-5 minutes. Deglaze pan with white wine (of drinkable quality) and simmer until wine has reduced by half. Add tomatoes, chicken stock, and a couple sprigs of fresh thyme, simmer 10 minutes. At this point you can either turn off the heat until ready to prepare the raviolis or cook them (yes it really is that easy…you know the saying, “less is best”)! When ready to cook the ravioli, remove from the frig, bring sauce up to a boil, place 2-3 ravioli in sauce (depending on your pan) and poach 1 minute. 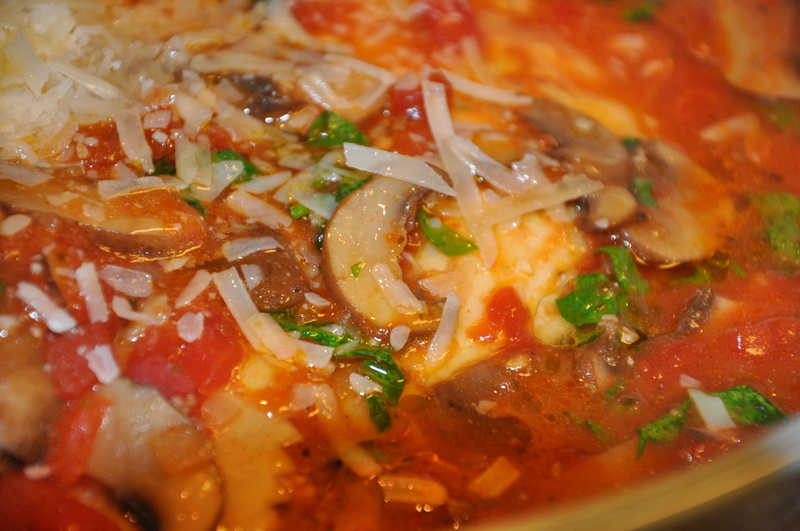 Remove ravioli with a slotted spoon and place in bowl or plate. Repeat until all ravioli’s are cooked. Ladle remaining sauce over ravioli. Top with a drop of lemon infused olive oil (not necessary but very yummy) and top with freshly grated cheese. 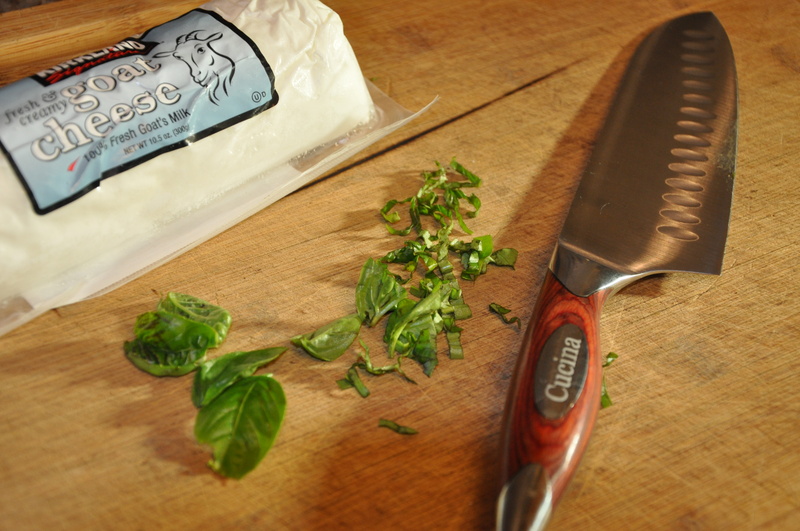 In the bowl of a food processor, add cheese, egg, pepper and basil, process until combined. Place one egg roll wrappers on work area, brush with egg wash. Place 2 heaping tablespoons cheese filling in center of each roll. Lay another egg roll wrap over cheese. Press and seal the edges, pushing out all air pockets. 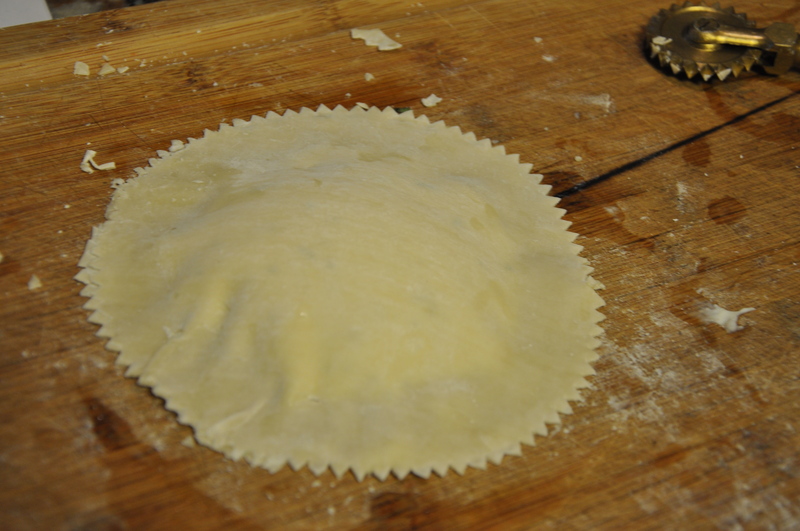 Trim ravioli with a round cutter and place on a baking sheet. Repeat until until filling is all used (should make 8 or 9). 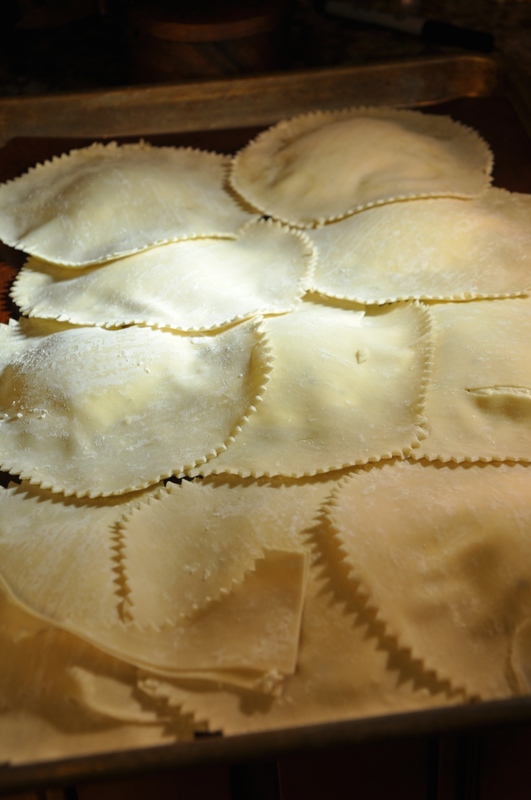 Place raviolis in refrigerator until ready to cook. In a 5 quart stock pot over medium heat, add butter and oil, cook until butter is melted. Add shallots, garlic, and white pepper. Cook until shallots are soft, about 3-5 minutes. Add wine and simmer until wine has reduced in half. Add tomatoes and chicken stock. Simmer 5 minutes. Keep sauce over medium low heat until ready to cook ravioli. 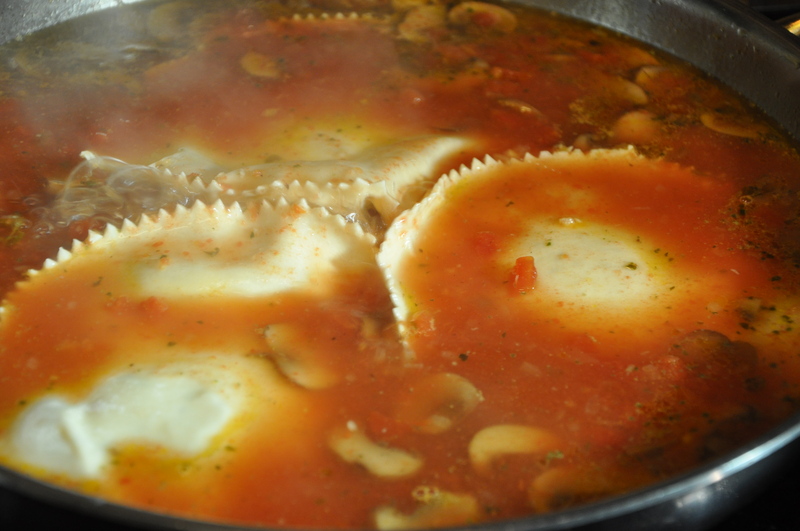 Place ravioli on slotted spoon and into the simmering stock to poach for one minute. Remove from stock, place in bowl. Continue cooking remaining ravioli. 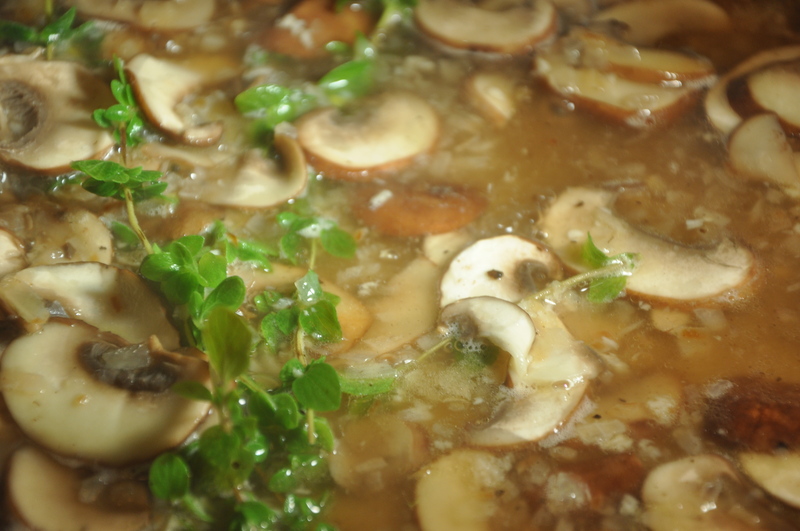 Add spinach to stock, simmer 1-2 minutes (remove thyme sprigs). 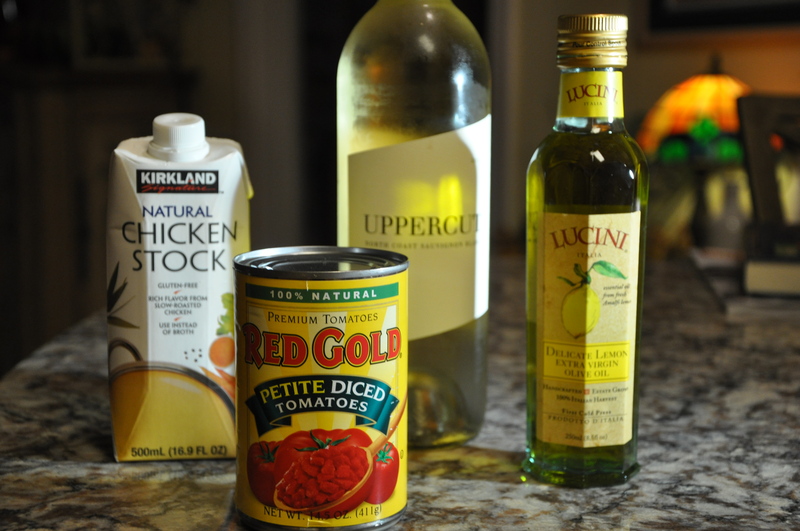 Ladle sauce over ravioli, sprinkle with grated cheese and a drop of lemon oil.